We have both Bibles and Jesus DVDs available in a variety of languages. Let us know if you are interested in receiving one of these either in English or in your own language. Contact Carol if you are interested in receiving any of these resources and to check for availability. These have been made available free of charge as a result of the kindness of a foundation. The Jesus Film Project has been seen by more than 6 billion people in 236 countries and has been translated into 900 languages. Taken straight from the Gospel of Luke, "JESUS" is recognized as one of the most accurate depiction of the life of Christ ever put on film. 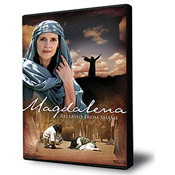 Filmed entirely on location in Israel, it takes you back nearly 2,000 years into the life and time of Jesus Christ. Here are some of the DVD's we have available - Just ask us for one! "JESUS" film in 8 languages: Cantonese, Foochow, Hakka, Mandarin, Shanghainese, Taiwanese, Uyghur and English. Subtitled in English, Chinese (simplified and traditional). The DVD also includes: "The Story of Jesus for Children" in Cantonese, Mandarin, and English. Subtitled in English. "JESUS" film in 16 languages: Arabic, Bengali, Bosnian, English, Farsi (Persian), French, Hausa, Indonesian, Kurdish (Behdini), Kurdish (Sorani), Punjabi, Russian (Central Asian), Somali, Turkish, Urdu, and Uyghur. Subtitled in English. "JESUS" film in 16 languages: Bengali (India), Bengali (Bangladesh), English, Gujarati, Hindi, Kannada, Malayalam, Marathi, Nepali, Punjabi (Indian), Punjabi (Western), Sindhi, Sinhala, Tamil, Telugu, and Urdu. Subtitled in English. "JESUS" film in 16 languages: Armenian, English, Estonian, Farsi (Persian), Georgian, German, Hebrew, Hungarian, Kazak, Latvian, Lithuanian, Romanian, Russian, Tajik, Ukrainian, and Uzbek. Subtitled in English. "JESUS" film in 16 languages: Amharic, Arabic (Modern Standard), Arabic (Modern Sudanese), Bari, Dinka (Northeastern-Padang), Dinka (South Central-Agar), English, Maay, Moru, Nuer, Oromo (West Central), Shilluk, Somali, Swahili (Tanzanian), Tigrinya (Ethiopian), and Zande. Subtitled in English and Arabic. (Languages spoken in Burkina Faso, Cote d'Ivoire, Guinea, Mali, Niger, Nigeria, and Senegal) - "JESUS" film in 16 languages: Bambara, English, French, Fulfulde (Adamawa), Fulfulde (Pulaar), Futa Jalon, Hausa, Jula/Dioula, Mandinka, Maninka, Maninka (Konyanka), Moore, Songai, Soninke, Wolof, and Zarma. Subtitled in English and French.